High percentage of the Republic of Macedonia mountainous. Macedonia is a landlocked country that is geographically clearly defined by a central valley formed by the Vardar river and framed along its borders by mountain ranges. Macedonia's terrain is mostly rugged, located between the Sar and Osogovo mountains, which frame the valley of the Vardar river. The Republic of Macedonia also has scenic mountains. They belong to two different ranges: Dinarska and Rodopska. The Dinarska range is the oldest with subsequent erosion; the Rodopska range is younger offering rugged, alpine scenery. The scenery in Macedonia offers rocky mountains and green, rolling hills covered with conifer forests and lined with countless freshwater streams and rivers. The total territory of Republic of Macedonia comes to 25,713 sq. km, of which 25,236 sq. km are land, while 477 sq. km are water surface. The lowest point is Vardar River (44 m) near Gevgelija, and the highest point is Golem Korab peak (2,764 m) in the north-western part of Macedonia. 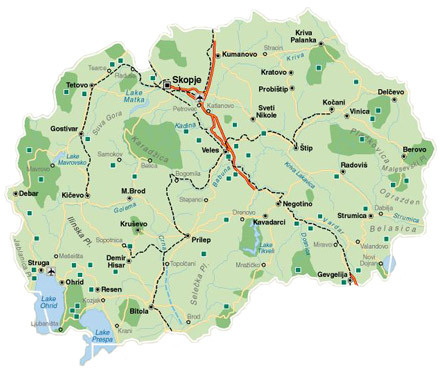 Macedonia has 766 km of boundaries, of which: 151 km with Albania; 148 km with Bulgaria; 246 km with Greece and 221 km with Serbia.